Stanley Engineered Fastening, Chesterfield, MI, is a Stanley Black & Decker Inc. company, specializing in design and development of cost-effective fasteners, assembly tools, and stud and welding systems. Items in the diverse line include fasteners and clips for metals and plastics, screws and bolts, torque nuts, threaded inserts, and a range of other products to meet individualized sealing and securing requirements. To convey these various items to packaging lines, Stanley had been using large static conveyors that were requiring significant maintenance and downtime for repairs. The company realized that it needed to convert to more efficient conveying equipment. After evaluating alternatives, Stanley decided to try a DynaCon light-weight plastic modular conveyor system from Dynamic Conveyor. 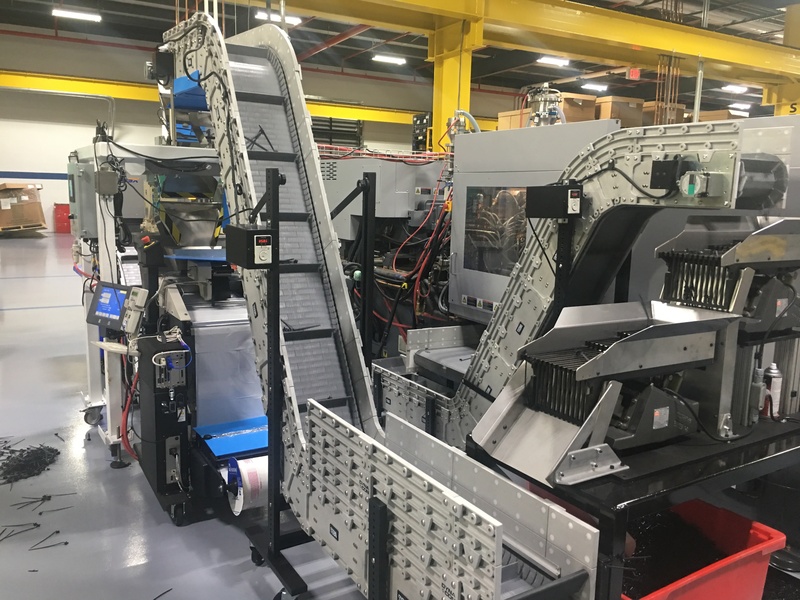 Stanley determined that this easily reconfigurable conveyor system could be purchased at a cost in line with standard conveyor prices, while offering greater flexibility and considerably reduced maintenance. The conveyors also are compact, requiring less floor space. By interfacing the conveyors with the molding machines, the system can reverse the conveyors when the molding process goes outside of process tolerances. Suspect product then is diverted to a separate tote that later can be dispositioned by the quality control department. The good products are delivered to the bagging station where they are bagged in specific quantities. An operator transfers the sealed bags to another conveyor for channeling to the boxing station.